You guys. KEY LIME PIE. That’s pretty much the definition of pie-perfection in my book, and these mini key lime pies are to die for. Love key lime pie like I do? You’ve come to the right place. When a group of my blogging friends and I decided to do a monthly Pinterest Remake challenge, I knew that I would have a blast. What I didn’t realize was that spending hours on Pinterest (and, no, I’m probably not exaggerating) would lead me to find way too many projects that I wanted to try and far too many ideas to work on. 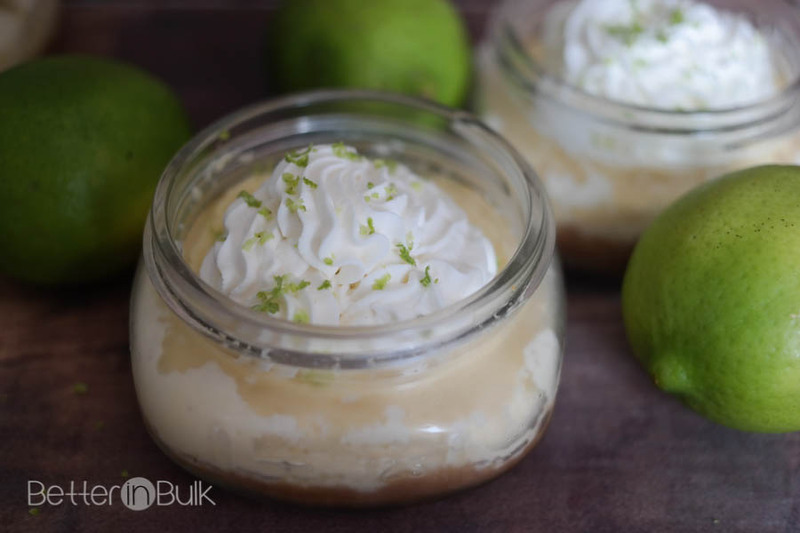 I narrowed my focus down to one particular pin for Key Lime Pies in a Jar, which lead me to a recipe found on Home Cooking Memories, one of my favorite foodie blogs. Although I’m sure that Brandie’s recipe didn’t need any changing, I was challenged to “remake” something I found on Pinterest so I gave it a slight make-over. I started my makeover on the crust. I LOVE a good graham cracker crust, and graham cracker crusts are the only way to go when key lime pies are in the picture. But…I’ve been experimenting with coconut oil and other alternatives to butter and fats, and I thought that the graham cracker crust would be a perfect place to do a little experimenting. I am also quite fond of cheesecakes, and I wondered how I might be able to give these mini pies a slight cheesecake texture. I added some light cream cheese and loved the result. 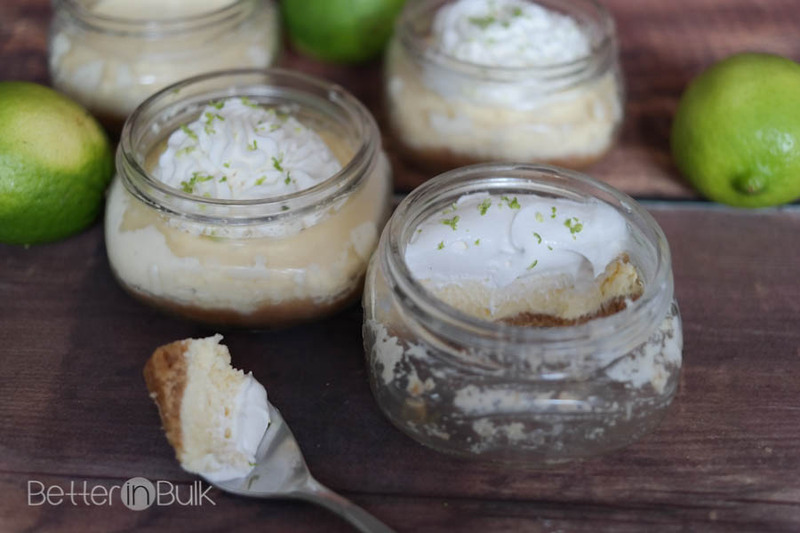 By the way, the key to making these delicious mini key lime pies so cute is the way they’re packaged…I used some wide mouth 8-ounce (half pint) mason jars that I found on Amazon (affiliate link). I vividly remember the first time I had mason jar desserts at a book club meeting years ago. Let’s just say that desserts packaged in mason jars are not only 1) great as single servings at parties and 2) great for portion control and 3) really convenient for transport (put a lid on each one, and there’s no mess! ), but 4) they are stand-out adorable and make a BIG impression! Ready for my Pinterest Remake of mini key lime pies in a jar? You have GOT to make this recipe! I have never had key lime pie before but it looks really good and have always wanted to try it. I love the little jars they are made in. LOVE these pies! We featured you at The Project Stash! Stop by and pick up your featured button. I can’t wait to see how you’ve used your stash this week! Thank you! I’ll be adding the button proudly. :) I’ve been craving these pies for over a week! I need to make them again soon! Hi Visiting from Inspire Me Monday Linky Party. Thank you for joining us on Monday. I’m Janice, one of your hostesses. Key lime Pie is my favorite dessert. Our key lime tree is in bloom now so I’m going to make these when I have book club. OK, I am insanely jealous that you have a key lime tree! My grandma and grandpa had huge lemon and lime trees in their yard when I was growing up. The memories! All of your recipes always look so good and this is no exception. 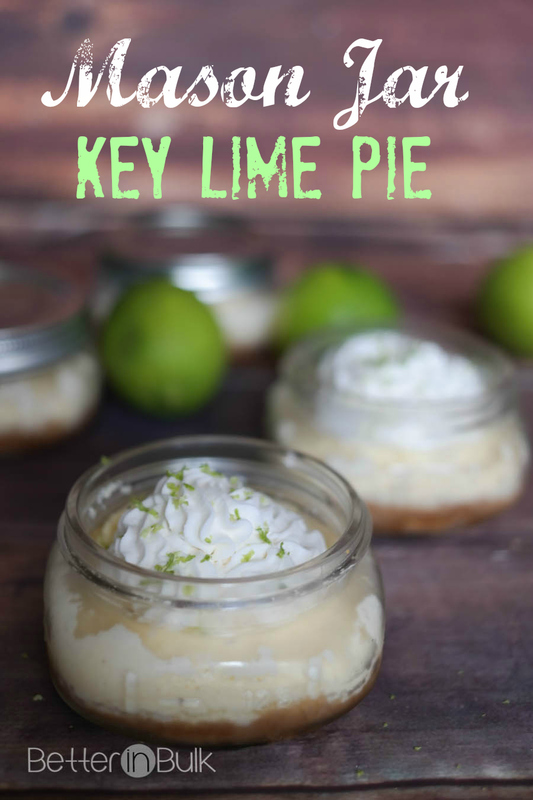 I can’t wait to make them because I am a huge key lime pie fan! These look delicious! I was just at Sam’s Club this evening and I saw something similar. I was so tempted to buy them. I’m so glad you posted this recipe! Now I can make my own. 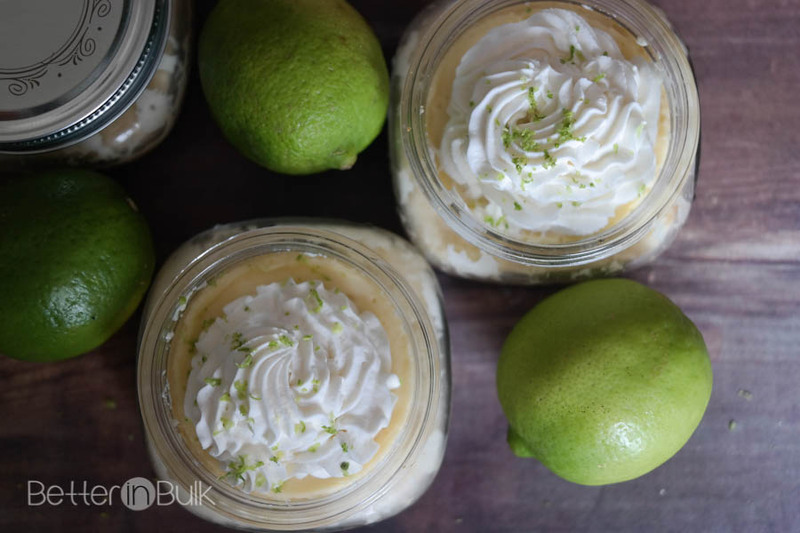 I love Key Lime Pie and it looks so pretty served in jars. I may do this for Easter – and for sure I’ll make it soon. That sounds so good. I love that it’s in its own container. That makes it easier for me not to have too many. My husband LOVES pie! I am going to make these for his birthday as a surprise. I know he is going to love them. Oh yum! I love key lime pie in any shape or form but the mini pies are extra cute!